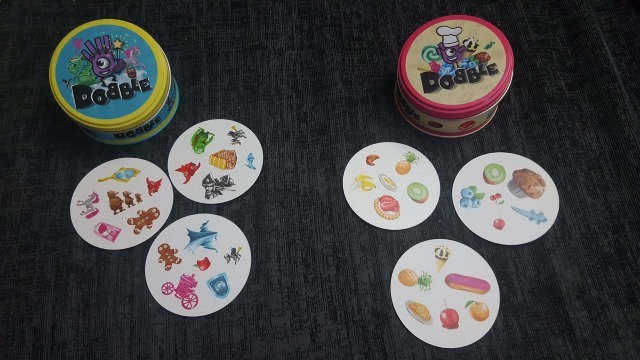 If you’re not familiar with Dobble, then there are two possible options: firstly you could take a look through our previous Dobble reviews (which consist of the time-based Chrono version, and the simpler Cars 3 themed game) or just accept that the main rule is simple – you need to find the matching picture on two cards in front of you. Even beyond that the details are pretty straightforward; you have a pile of cards with various images on, and for any pair of cards there will be a single matching image between them. Through various game modes you try and pair the cards up by finding the common component, and the game moves on at a pretty slick pace. My son loves playing these games. He takes them on holiday, he takes them to his cousin’s house so they can play them together, and we quite often have a couple of games as a family. It’s a nice, quick game that can be over in 10 minutes and still provide some mild panic and fun moments as everyone gets that tiny bit too competitive. But as with most games that have so few components, it can start to get a bit boring having the same images game in, game out. But new games? And not only that, two new games in a single box? That’s what Dobble Junior offers, giving us two whole new sets of cards to fight over and enjoy, meanwhile bringing the family’s enjoyment of Dobble right back into the mix again. These two sets are pretty different in theme, and I really liked that. In the one tin you’ve got the food related game, hosting images of cookies, kiwis, sweets and so on. The other offers up a fantasy based game, with knights, pitchforks and plenty of references to fairy stories like the three bears and Little Red Riding Hood. Both sets have some great looking colourful images on, and both come with an insert set of rules which provide numerous ways to play to keep things interesting after the first couple of games. It still breaks my brain a bit when I try to work out the maths needed to make sure that every single combination of two cards has one – and only one – image in common, and it works perfectly. Some images are smaller than others making it less obvious when finding a match, and with other players claiming cards and moving things around while you’re busy trying to find your own matches the pace and frantic nature of the games are every bit as present as they always have been. Essentially there isn’t a great deal else to talk about with this. It’s the same game with different pictures, but bundling two games together is a great idea, and my son absolutely loved having some new themes to try out now that his obsession with Cars is starting to dwindle a little. 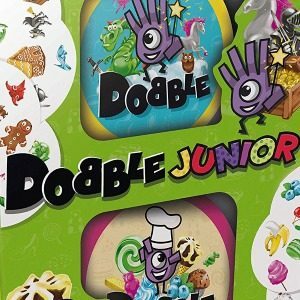 As mentioned earlier we’ve always enjoyed playing the various versions of Dobble, and with these new sets now sitting proudly in the collection I imagine we’ll be enjoying it for a fair while longer as well. If you’ve already got some Dobble sets, these will rekindle the fire a bit. If not, and you’re looking for something fun and quick to play with the kids, jump at this double pack. It’s worth every penny.